The urban heat island effect leads to increased rainfall, both in amounts and intensity, downwind of cities. Global warming is also causing changes in the precipitation pattern globally, including wetter conditions across eastern North America and drier conditions in the tropics. [ citation needed] Antarctica is the driest continent. The globally averaged annual precipitation over land is 715 mm (28.1 in), but over the whole Earth it is much higher at 990 mm (39 in). Climate classification systems such as the Köppen classification system use average annual rainfall to help differentiate between differing climate regimes. Rainfall is measured using rain gauges. Rainfall amounts can be estimated by weather radar. The wet, or rainy, season is the time of year, covering one or more months, when most of the average annual rainfall in a region falls. The term green season is also sometimes used as a euphemism by tourist authorities. Areas with wet seasons are dispersed across portions of the tropics and subtropics. Savanna climates and areas with monsoon regimes have wet summers and dry winters. Tropical rainforests technically do not have dry or wet seasons, since their rainfall is equally distributed through the year. 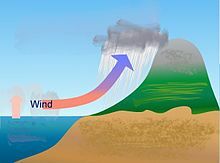 Some areas with pronounced rainy seasons will see a break in rainfall mid-season when the intertropical convergence zone or monsoon trough move poleward of their location during the middle of the warm season. 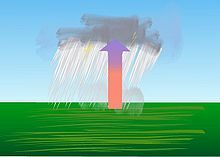 When the wet season occurs during the warm season, or summer, rain falls mainly during the late afternoon and early evening hours. The wet season is a time when air quality improves,  freshwater quality improves,   and vegetation grows significantly. where Z represents the radar reflectivity, R represents the rainfall rate, and A and b are constants. Satellite derived rainfall estimates use passive microwave instruments aboard polar orbiting as well as geostationary weather satellites to indirectly measure rainfall rates. If one wants an accumulated rainfall over a time period, one has to add up all the accumulations from each grid box within the images during that time. Precipitation, especially rain, has a dramatic effect on agriculture. All plants need at least some water to survive, therefore rain (being the most effective means of watering) is important to agriculture. While a regular rain pattern is usually vital to healthy plants, too much or too little rainfall can be harmful, even devastating to crops. Drought can kill crops and increase erosion,  while overly wet weather can cause harmful fungus growth. Plants need varying amounts of rainfall to survive. For example, certain cacti require small amounts of water,  while tropical plants may need up to hundreds of inches of rain per year to survive. The equatorial region near the Intertropical Convergence Zone (ITCZ), or monsoon trough, is the wettest portion of the world's continents. 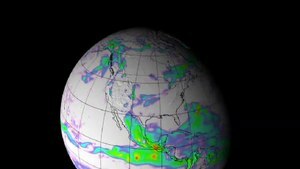 Annually, the rain belt within the tropics marches northward by August, then moves back southward into the Southern Hemisphere by February and March. Within Asia, rainfall is favored across its southern portion from India east and northeast across the Philippines and southern China into Japan due to the monsoon advecting moisture primarily from the Indian Ocean into the region. The monsoon trough can reach as far north as the 40th parallel in East Asia during August before moving southward thereafter. Its poleward progression is accelerated by the onset of the summer monsoon which is characterized by the development of lower air pressure (a thermal low) over the warmest part of Asia. Similar, but weaker, monsoon circulations are present over North America and Australia. During the summer, the Southwest monsoon combined with Gulf of California and Gulf of Mexico moisture moving around the subtropical ridge in the Atlantic Ocean bring the promise of afternoon and evening thunderstorms to the southern tier of the United States as well as the Great Plains. The eastern half of the contiguous United States east of the 98th meridian, the mountains of the Pacific Northwest, and the Sierra Nevada range are the wetter portions of the nation, with average rainfall exceeding 760 mm (30 in) per year. Tropical cyclones enhance precipitation across southern sections of the United States,  as well as Puerto Rico, the United States Virgin Islands,  the Northern Mariana Islands,  Guam, and American Samoa. 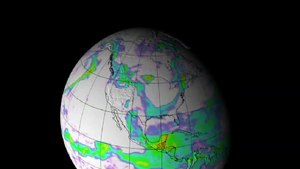 The El Niño-Southern Oscillation affects the precipitation distribution, by altering rainfall patterns across the western United States,  Midwest,   the Southeast,  and throughout the tropics. There is also evidence that global warming is leading to increased precipitation to the eastern portions of North America, while droughts are becoming more frequent in the tropics and subtropics. Cherrapunji, situated on the southern slopes of the Eastern Himalaya in Shillong, India is the confirmed wettest place on Earth, with an average annual rainfall of 11,430 mm (450 in). The highest recorded rainfall in a single year was 22,987 mm (905.0 in) in 1861. The 38-year average at nearby Mawsynram, Meghalaya, India is 11,873 mm (467.4 in). The wettest spot in Australia is Mount Bellenden Ker in the north-east of the country which records an average of 8,000 mm (310 in) per year, with over 12,200 mm (480.3 in) of rain recorded during 2000. The Big Bog on the island of Maui has the highest average annual rainfall in the Hawaiian Islands, at 10,300 mm (404 in). Mount Waiʻaleʻale on the island of Kauaʻi achieves similar torrential rains, while slightly lower than that of the Big Bog, at 9,500 mm (373 in)  of rain per year over the last 32 years, with a record 17,340 mm (683 in) in 1982. [ citation needed] Its summit is considered one of the rainiest spots on earth, with a reported 350 days of rain per year. Lloró, a town situated in Chocó, Colombia, is probably the place with the largest rainfall in the world, averaging 13,300 mm (523.6 in) per year. The Department of Chocó is extraordinarily humid. Tutunendaó, a small town situated in the same department, is one of the wettest estimated places on Earth, averaging 11,394 mm (448.6 in) per year; in 1974 the town received 26,303 mm (86 ft 3.6 in),[ citation needed] the largest annual rainfall measured in Colombia. Unlike Cherrapunji, which receives most of its rainfall between April and September, Tutunendaó receives rain almost uniformly distributed throughout the year. Quibdó, the capital of Chocó, receives the most rain in the world among cities with over 100,000 inhabitants: 9,000 mm (354 in) per year. Storms in Chocó can drop 500 mm (20 in) of rainfall in a day. This amount is more than what falls in many cities in a year's time. ^ a b c d Emmanuel Villermaux, Benjamin Bossa; Bossa (September 2009). "Single-drop fragmentation distribution of raindrops" (PDF). Nature Physics. 5 (9): 697–702. Bibcode: 2009NatPh...5..697V. doi: 10.1038/NPHYS1340. Archived (PDF) from the original on 2012-03-05. Lay summary. ^ Robert A. Houze Jr (October 1997). "Stratiform Precipitation in Regions of Convection: A Meteorological Paradox?" (PDF). Bulletin of the American Meteorological Society. 78 (10): 2179–2196. Bibcode: 1997BAMS...78.2179H. doi: 10.1175/1520-0477(1997)078<2179:SPIROC>2.0.CO;2. ISSN 1520-0477. ^ Marshall, J. S.; Palmer, W. M. (1948). 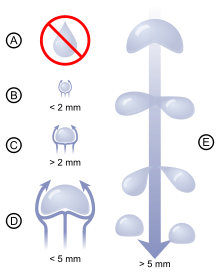 "The distribution of raindrops with size". J. Meteorol. 5 (4): 165–166. Bibcode: 1948JAtS....5..165M. doi: 10.1175/1520-0469(1948)005<0165:tdorws>2.0.co;2. ^ Houze Robert A.; Hobbs Peter V.; Herzegh Paul H.; Parsons David B. (1979). "Size Distributions of Precipitation Particles in Frontal Clouds". J. Atmos. Sci. 36 (1): 156–162. Bibcode: 1979JAtS...36..156H. doi: 10.1175/1520-0469(1979)036<0156:SDOPPI>2.0.CO;2. ^ Niu, Shengjie; Jia, Xingcan; Sang, Jianren; Liu, Xiaoli; Lu, Chunsong; Liu, Yangang (2010). "Distributions of Raindrop Sizes and Fall Velocities in a Semiarid Plateau Climate: Convective versus Stratiform Rains". J. Appl. Meteorol. Climatol. 49 (4): 632–645. Bibcode: 2010JApMC..49..632N. doi: 10.1175/2009JAMC2208.1. ^ van der Westhuizen W.A. ; Grobler N.J.; Loock J.C.; Tordiffe E.A.W. (1989). "Raindrop imprints in the Late Archaean-Early Proterozoic Ventersdorp Supergroup, South Africa". Sedimentary Geology. 61 (3–4): 303–309. Bibcode: 1989SedG...61..303V. doi: 10.1016/0037-0738(89)90064-X. ^ Som, Sanjoy M.; Catling, David C.; Harnmeijer, Jelte P.; Polivka, Peter M.; Buick, Roger (2012). "Air density 2.7 billion years ago limited to less than twice modern levels by fossil raindrop imprints". Nature. 484 (7394): 359–362. Bibcode: 2012Natur.484..359S. doi: 10.1038/nature10890. PMID 22456703. ^ Andrea Prosperetti & Hasan N. Oguz (1993). "The impact of drops on liquid surfaces and the underwater noise of rain". Annual Review of Fluid Mechanics. 25: 577–602. Bibcode: 1993AnRFM..25..577P. doi: 10.1146/annurev.fl.25.010193.003045. ^ Robert Houze (October 1997). "Stratiform Precipitation in Regions of Convection: A Meteorological Paradox?". Bulletin of the American Meteorological Society. 78 (10): 2179–2196. Bibcode: 1997BAMS...78.2179H. doi: 10.1175/1520-0477(1997)078<2179:SPIROC>2.0.CO;2. ISSN 1520-0477. ^ R. S. Cerveny & R. C. Balling (1998-08-06). "Weekly cycles of air pollutants, precipitation and tropical cyclones in the coastal NW Atlantic region". Nature. 394 (6693): 561–563. Bibcode: 1998Natur.394..561C. doi: 10.1038/29043. ^ University of Wisconsin–Madison (1998). Objective Dvorak Technique. Archived 2006-06-10 at the Wayback Machine Retrieved on 2006-05-29. ^ Joan D. Willey; Bennett; Williams; Denne; Kornegay; Perlotto; Moore (January 1988). "Effect of storm type on rainwater composition in southeastern North Carolina". Environmental Science & Technology. 22 (1): 41–46. Bibcode: 1988EnST...22...41W. doi: 10.1021/es00166a003. PMID 22195508. ^ Joan D. Willey; Kieber; Avery (2006-08-19). "Changing Chemical Composition of Precipitation in Wilmington, North Carolina, U.S.A.: Implications for the Continental U.S.A". Environmental Science & Technology. 40 (18): 5675–5680. Bibcode: 2006EnST...40.5675W. doi: 10.1021/es060638w. ^ Kang-Tsung Chang, Jr-Chuan Huang; Shuh-Ji Kao & Shou-Hao Chiang (2009). "Radar Rainfall Estimates for Hydrologic and Landslide Modeling". Data Assimilation for Atmospheric, Oceanic and Hydrologic Applications: 127–145. doi: 10.1007/978-3-540-71056-1_6. ISBN 978-3-540-71056-1. Retrieved 2010-01-15. ^ Panagos, Panos; Ballabio, Cristiano; Borrelli, Pasquale; Meusburger, Katrin; Klik, Andreas; Rousseva, Svetla; Tadić, Melita Perčec; Michaelides, Silas; Hrabalíková, Michaela; Olsen, Preben; Aalto, Juha; Lakatos, Mónika; Rymszewicz, Anna; Dumitrescu, Alexandru; Beguería, Santiago; Alewell, Christine (2015). "Rainfall erosivity in Europe". Science of the Total Environment. 511: 801–814. Bibcode: 2015ScTEn.511..801P. doi: 10.1016/j.scitotenv.2015.01.008. PMID 25622150. ^ Reggiani, P.; Weerts, A. H. (February 2008). "Probabilistic Quantitative Precipitation Forecast for Flood Prediction: An Application". Journal of Hydrometeorology. 9 (1): 76–95. Bibcode: 2008JHyMe...9...76R. doi: 10.1175/2007JHM858.1. ^ A. G. Barnston (1986-12-10). "The effect of weather on mood, productivity, and frequency of emotional crisis in a temperate continental climate". International Journal of Biometeorology. 32 (4): 134–143. Bibcode: 1988IJBm...32..134B. doi: 10.1007/BF01044907. Retrieved 2010-01-15. ^ Bear, I.J. ; R.G. Thomas (March 1964). "Nature of argillaceous odour". Nature. 201 (4923): 993–995. Bibcode: 1964Natur.201..993B. doi: 10.1038/201993a0. ^ David J. Gochis; Luis Brito-Castillo & W. James Shuttleworth (2006). "Hydroclimatology of the North American Monsoon region in northwest Mexico". Journal of Hydrology. 316 (1–4): 53–70. Bibcode: 2006JHyd..316...53G. doi: 10.1016/j.jhydrol.2005.04.021. ^ Kristen L. Corbosiero; Michael J. Dickinson & Lance F. Bosart (2009). "The Contribution of Eastern North Pacific Tropical Cyclones to the Rainfall Climatology of the Southwest United States". Monthly Weather Review. 137 (8): 2415–2435. Bibcode: 2009MWRv..137.2415C. doi: 10.1175/2009MWR2768.1. ISSN 0027-0644. Archived from the original on 2012-01-06. ^ Katharina Lodders (2004). "Jupiter Formed with More Tar than Ice". The Astrophysical Journal. 611 (1): 587–597. Bibcode: 2004ApJ...611..587L. doi: 10.1086/421970.